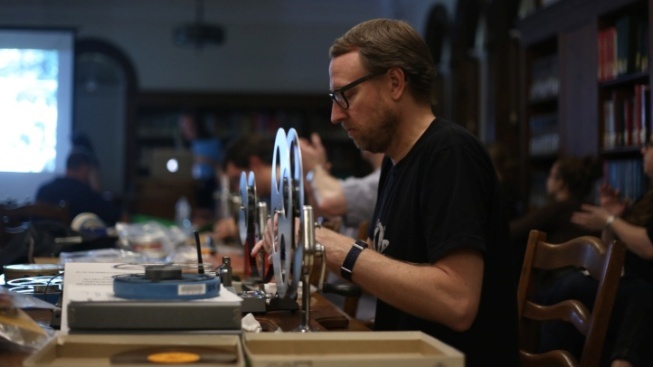 A projectionist will screen your vintage reel at the Griffith Park museum. Nice? It's free. A projectionist will screen your vintage reel at the Griffith Park museum. Nice? It's free. Be there on Oct. 21, 2018. While we can name many important artifacts, documents, and treasures that have helped to tell the human story, one of the humblest, most recent, and most common of all historical records is one we can probably find in the attic: the home movie. Of course, "humblest" and "common" are not exactly accurate, for home movies have become essential and important look-backs into how people have lived their domestic and private lives since, pretty much, the dawn of film, or at least the at-home movie camera. If you've got a home movie you love, perhaps a reel passed down to you from a grandparent, there's a way to watch it, and share it with other enthusiasts of the form: Home Movie Day Los Angeles is just ahead, and it is free to join. Show at The Autry Museum of the American West on Sunday, Oct. 21 — you'll want to RSVP first — and be sure to have a 16mm, 8mm, or Super 8 film in tow. "Professional film archivists will inspect your prints," beginning at 10 in the morning, and if a splice or fix-up is required, they'll get on it. Screenings start at noon, which means that if you're in a seat, you'll be able to savor the sweet, funny, or offbeat cinematic stories that your fellow attendees brought in, alongside the one you yourself delivered. Home Movie Bingo, door prizes, and lots of love for home-movie-dom, including "helpful tips on caring for your films," are part of the educational and entertaining day. So, what's on that vintage reel at the bottom of the cardboard box in the hall closet? Your aunt's sweet sixteen birthday party? The happy day your grandparents bought their first car? Head to The Autry for this domestically delightful day of seeing how we once lived in the long-ago past, and the not-so-long-ago past, too.